You are looking at a rare silver medal for Fighting Smallpox. 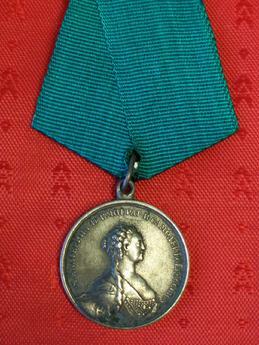 This medal was first instituted by Catherine II on October 12, 1768. It was reinstituted on February 16, 1826 by Nicholas I. 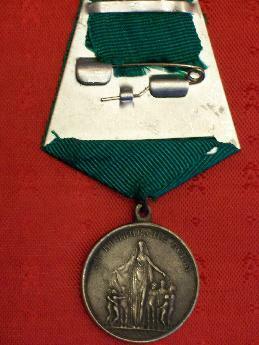 This medal was awarded to doctors, clergy, and other medical personel, who helped with immunisation. The obverse of the Medal has the bust of Catherine II facing right surrounded by the Inscription, CATHERINE II EMPRESS AND AUTOCRAT OF ALL THE RUSSIAS. The reverse of the Medal shows a goddess Gigiea covering 7 small childern with her arms. The signature of the engraver: "A. Lyalin" is placed under the goddess.